Panama City Beach vacation rental home at Majestic Beach condos. Gulf-front penthouse, wide private balcony with beachfront view that can’t be beat, great amenities - 5 swimming pools, hot tubs, direct beach access, beautiful well-managed condo common areas, great fitness center, movie theater, tennis courts, and location close to my favorite restaurants, bars and shops. Full bath with shower and full, well out-fitted kitchen that seats 4 at the bar. Washer & dryer inside the property, along with everything you need for the perfect beach vacation. 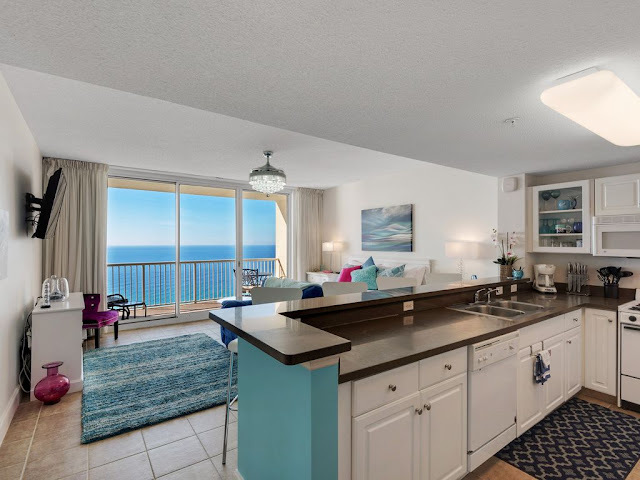 Comfortable balcony furniture, large flat-screen HDTV with DVD player and comfy couch..
Panama City Beach is situated on the Florida panhandle just east of the South Walton/30A, this semitropical weather offers an abundance of outdoor activities. Approx. 50" of rain is received in the area annually, overlooking the Gulf of Mexico, high humidity is the norm during the summer. Thunderstorms occur often in the summer months, but are normally short in duration, with sunshine returning promptly. Winter, by comparison, is delightfully much cooler and drier, making for ideal conditions for enjoying outdoor activities, making the area a popular snowbird retreat. Info: 1 Bedroom, 1 Bath Gulf-front Property with 744+/- s.f., Sleeps up to 4.